By Liam McInerney | May 6, 2015. The plans for Kevin Street Cross Section, Sourced by Dept of Justice. 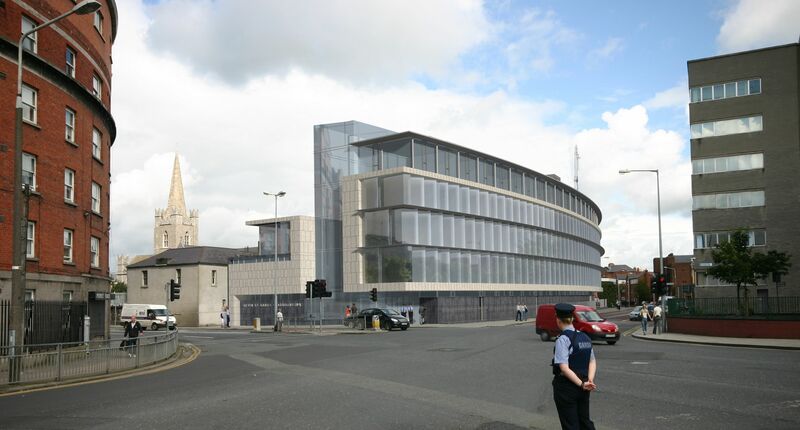 Construction on a new Garda Headquarters to replace Kevin Street Garda station is currently underway with the fate of the old building as yet undecided. The Office of Public Works (OPW) is in charge of the development which began construction in February. 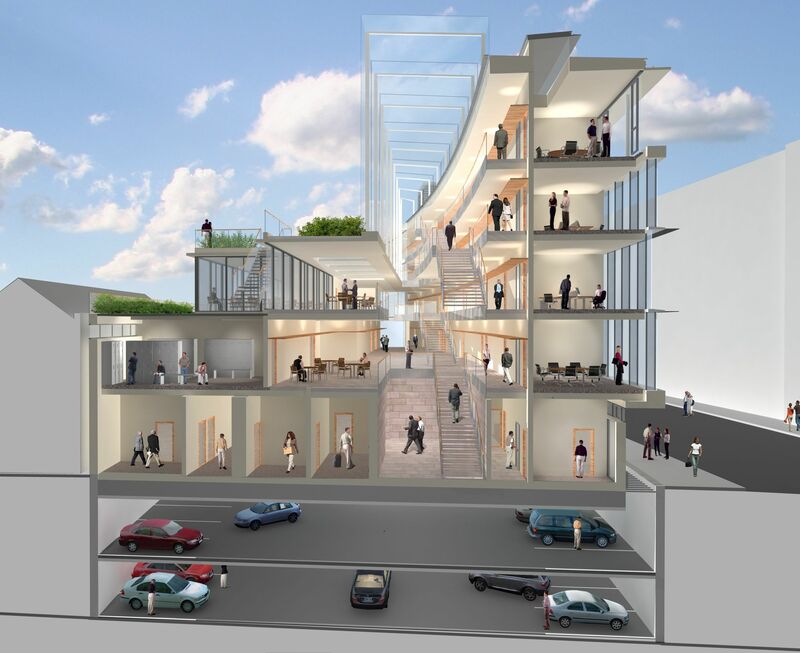 They estimate the buildings should take two years to complete and will cover an area of 6,840sqm on a former carpark along Bride Street and Kevin Street. The current station is located on a medieval palace in a historically important area of Dublin. Jason McElligott, the keeper of Marsh’s Library, which is on the site, thinks the old Garda building should be used as a Jonathan Swift centre once the headquarters is built. But he warned that it’s possible the building could end up derelict. “The danger is that the building could become a source of anti-social behaviour. This will change the character of the area when DIT moves their buildings to Grangegorman because the whole place will be dead by 5 o’clock,” he said. By using the old Garda station as a Jonathan Swift centre, Mr McElligott stated that it would benefit tourism and the local community. Jonathan Swift was an Anglo-Irish writer best known for his classic “Gulliver’s Travels” and who later went on to become Dean of Saint Patrick’s Cathedral in Dublin’s Liberties. Mr McElligott said: “The building is small so it’s not a possibility to knock down walls because it’s a protected structure. You would have to bring the building back to its essence and use things like white-washed walls and then technology to visually recreate different rooms, reflecting different aspects of Swift’s life.” He then added that the space could also be used for conferences, concerts and meetings. According to McElligott, the Garda station is in “pretty poor condition” and would require a lot of funding. “The big thing that we think is really important and shouldn’t be forgotten in any of this is that whatever goes in there should have a relationship with the local community,” added Mr McElligott. He also stated that he believes the OPW are aware of the significance of the medieval building and will strive to use it appropriately. Máire Ní Fhaircheallaigh – spokeswoman for the OPW – clarified this. “The OPW is fully aware of the historical importance of the existing Kevin Street Garda station building. It has recently opened up a dialogue with interested parties in order to explore a future use for the premises following the completion of the new Divisional Garda station,” she said. The Dublin Civic Trust is keen to see what happens to the building and have said they would like it to become a civic museum. Jason McElligott responded by saying it was an “interesting idea that should go into the mix.” According to the OPW the new station will consist of conference facilities, vehicular testing, garage workshops, PEMS stores, a public reception, prisoner processing areas, ESB sub-station, landscaped roof terrace and associated ancillary spaces.